It’s been a long time coming, but Twitter has finally updated its Mac OS X app to fit in much better with the latest OS X Yosemite and El Capitan updates. The changes are more than skin deep here, with the company adding some much-needed features, making Twitter 4.0 its best app yet. Amongst the new improvements that will get many excited you’ll find the new support for not only GIFs but also inline video playback, which should keep things flowing nicely when scrolling through your long timeline full of tweets. Support for Twitter’s not-so-new-now Quote Tweet functionality has been added, and a new dark theme gives the whole Twitter app a sharper look for those that like things to look a little more, well, dark. There’s still an option for a white theme, though, so there’s no need to worry if you’re a little perturbed by the quest to make all apps look the same these days. Those who like their Mac OS X Notification Center widgets – yes, both of them – will be stoked to learn that Twitter now has one. It’s actually quite good too, with trending subjects and a highlights section giving users an at-a-glance idea of what’s going on in their timeline. 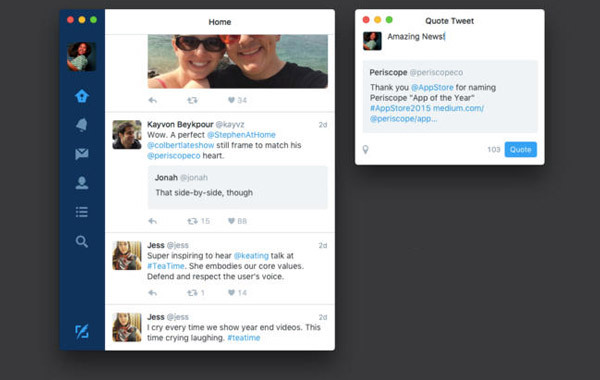 Twitter for Mac is getting the update you’ve been asking for. Now it looks and feels more like the Twitter you carry with you everyday. • Inline video playback – You’ll see videos play directly in your feed. • GIFs support – See animations without leaving your timeline. 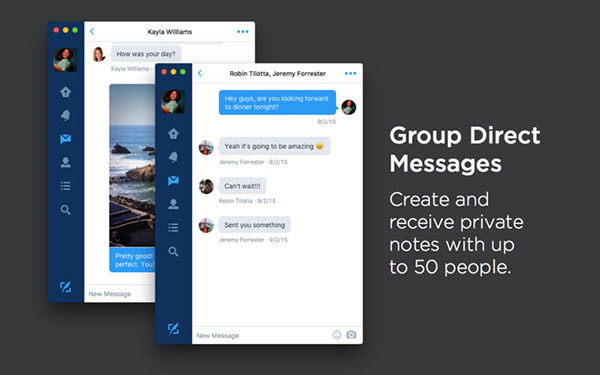 • Group Direct Messages – Create and receive private notes with up to 50 people. • Mute – Silence specific accounts so you no longer see them in your feed. • Today Center Widget – Get your Twitter Highlights right on your desktop. 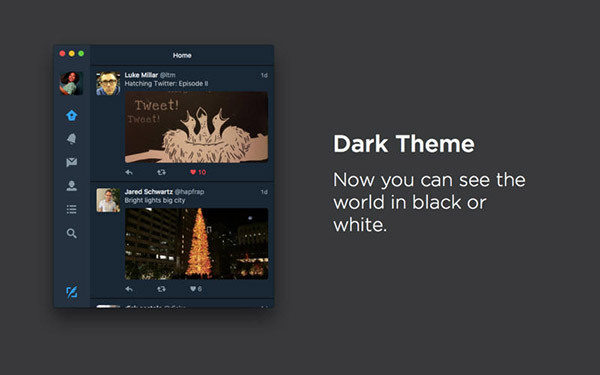 • Dark Theme – Now you can see the world in black or white. • Updated design – Get the latest improvements to icons, buttons, and interactions. • Quote Tweet – Add your two cents to any Retweet. Overall, this is quite the update for an app that has in the past been the subject of much scorn, so well played to Twitter’s Mac developers for that. Why it has taken quite so long is beyond us, though, so here’s hoping the next big update doesn’t stretch too far into the app’s future. Why people feel the need to use an app instead of a website is beyond me. finally the app is updated…now is look cool and way better than before.